Since 2014, there has been an increased national awareness regarding how police interact with the public during arrests and emergency situations. The autism community is no exception. During search and rescue missions, crime scene investigation, medical emergencies, and human services investigations, the way in which police and other first responders serve individuals with an autism spectrum disorder (ASD) needs to be adjusted. As ASD covers a spectrum, and no two individuals respond the same way, it is crucial that first responders are well-educated and trained on possible ways someone on the spectrum may respond during an emergency. Efforts to increase training for first responders have been noted nationwide, with one of the largest contributors being Safe and Sound, an Autism Society of America initiative. (Gammicchia & Johnson) Safe and Sound distributed literature instructing paramedics and emergency room staff on best ways to provide services for individuals on the spectrum. This literature highlighted the issues of hyper/hyposensitivity to pain and the importance of obtaining previous medical records to check for co-occurring symptoms including seizure disorders. Safe and Sound also acknowledged that people on the spectrum might have trouble following typical procedures, may run from sirens, be unable to recognize police badges, or struggle to follow instructions given by an officer. They urge first responders to explain their actions before carrying them out using age-appropriate language and adjusting where necessary. First responders are encouraged to be patient with individuals who repeat themselves or the first responders (echolalia) and continue to explain themselves and their actions clearly to children who are nonverbal. Above all, Safe and Sound stress the importance of making the individual as comfortable as possible, allowing a trusted caretaker and any comfort items to remain present whenever possible. This year, a study was published in the Journal of Autism and Developmental Disorders that reported most of the families involved in their study who had interactions with the police were satisfied with their experience. (Tint, Palucka, Bradley, Weiss, & Lunsky, 2017) The parents studied varied from those with young children on the spectrum to parents caring for adult children with ASD. This may be in part to many local police departments are taking time to train their officers on the best methods to interact with people with ASD. In addition, popular websites among law enforcement including www.officer.com are promoting articles on best practices for responding to a call involving someone with autism. Being as prepared as possible for an emergency can bring great peace of mind to parents and caregivers of children with autism. In moments of extreme stress, it is easy to forget information you know by heart any other day. Keeping a laminated document with a list of your child’s doctor/specialists, diagnoses, medications, allergies, as well as any info on what your child responds best to as well as what to avoid can be helpful to give first responders or hospital staff. You may want to keep a laminated copy in the home, in your vehicle, and with you when you travel. Some families choose to provide their child with a medical bracelet or necklace stating their autism diagnosis. As appropriate, it is important to have conversations with your child about what to do in an emergency. This could look like practicing stop, drop, and roll or learning basic signs like “choking,” “help,” and “yes” and “no.” Additionally, safeguarding your home is essential. Many children have a tendency to wander or run away and may benefit from a deadbolt lock on exterior doors above their reach. Finally, many cities offer registries for individuals with special/medical needs so first responders can be aware before responding or in cases of natural disasters. Your child’s pediatrician or occupational therapist can help you determine the most effective ways to plan for and teach your child about emergencies. 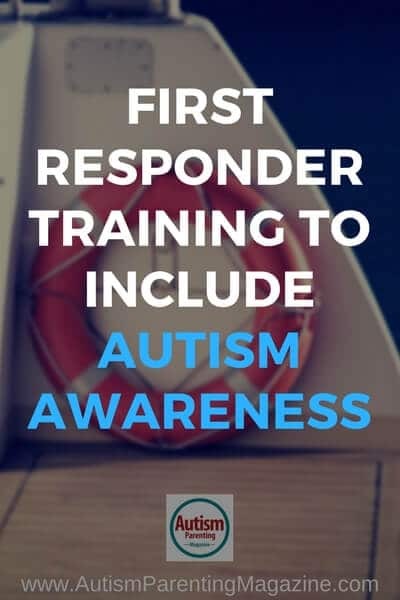 The JUSTin Hope Foundation in Reno Nevada has been doing First Responder training with an emphasis on Autism Awareness for over two years and have trained over 1800 Fire,Police,EMS and dispatchers in the state of Nevada. They are going to be working on getting this to be a state mandated class for all first responders.